A name can say a lot. The deck you play in a card game can represent a variety of things—from ancient tomes, powerful spells, and stalwart allies that help you battle Ancient Ones in Arkham Horror: The Card Game, to the schemes and plots you set to motion in A Game of Thrones: The Card Game. 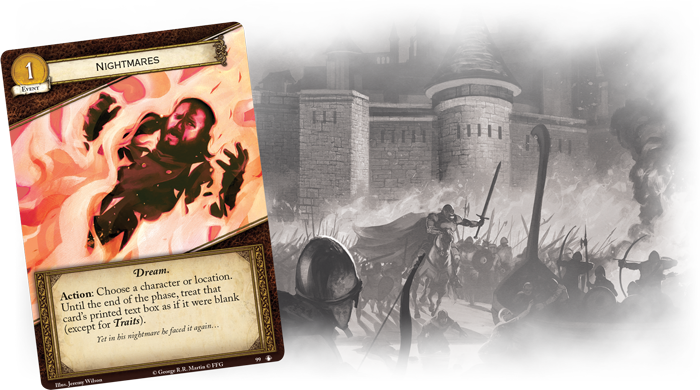 To draw players into a game's world and enhance their experience, every one of these cards needs to set itself apart from the others, both thematically and mechanically. In today's Designer Journal, Brad Andres walks us through the delicate design process of choosing names for cards and what it takes for a card to truly stand out from the crowd! What’s in a name? A card by any other name would smell as sweet. Right? Well, cards don’t really smell or taste that sweet (trust me, I checked), and if a card has a stinker of a name it’s not going to be nearly as fun. Today, I’m going to take a closer look at a part of game design that—if done correctly—blends seamlessly with the game experience: coming up with good card titles. I’ll go about this examination by looking at four elements that make up what I’m going to call “Name Theory:” Mechanics, Flavor, Aesthetics, and Functionality. Let’s dive in! A card’s mechanical function is one of our foremost concerns as designers, and a card’s name has more impact than one might think on a card’s mechanics. The primary mechanical function that a card’s name provides is identity. This is important so that players don't confuse one card for another and that when a player announces they are playing a card, their opponent knows exactly which card they're talking about. We generally try to avoid using card titles that are too similar to one another, especially if the cards also have similar effects. 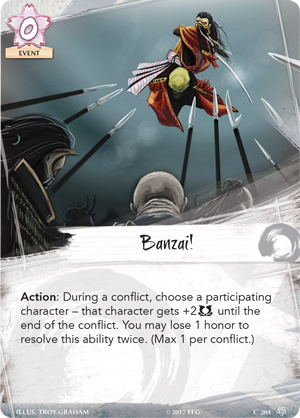 For example, if we printed a card for Legend of the Five Rings: The Card Game called Bonsai!, it would be incredibly easy to mistake the card for the Banzai! (Core Set, 204) event in the Core Set. Another mechanical benefit is that a card's name can provide a preview of what the card actually does, even before reading the ability. 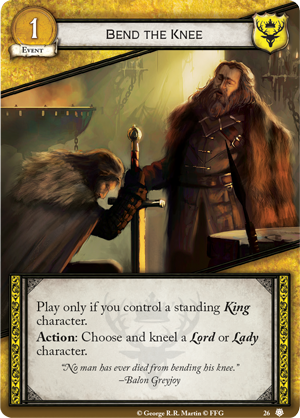 A card like Bend the Knee (House of Thorns, 26) from A Game of Thrones: The Card Game, tells you right in the title what it does—it kneels a character! This provides players with a mental shortcut when scanning the cards in their hand. 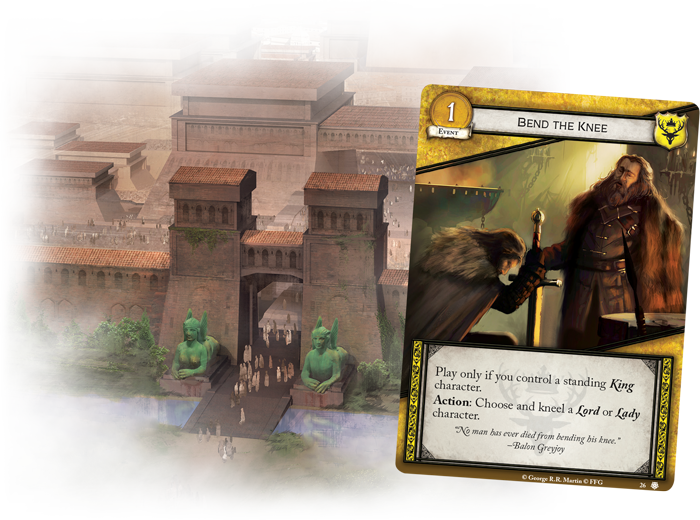 What a card represents in the game’s setting is an essential part of its identity, and the name is integral to establishing that representation within a player’s mind. A good card title can create a story of what happens when the card is played. 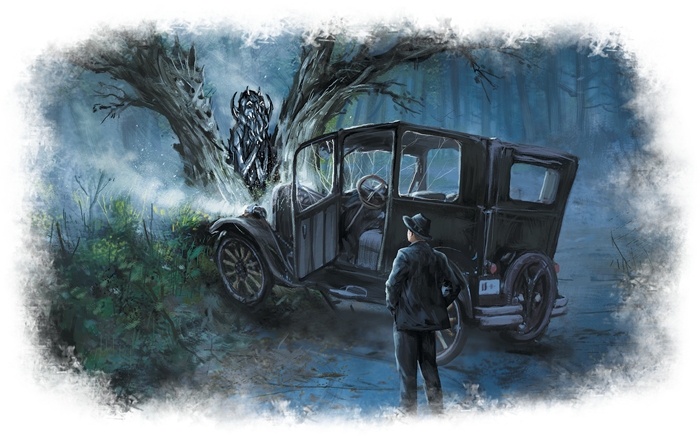 A card from Arkham Horror: The Card Game, "Look what I found!" (Core Set, 79), is a great example of this, as it takes the effect of turning failure into opportunity and turns it into a memorable game moment. A card’s title can also differentiate a game’s setting from many of the other game worlds out there. 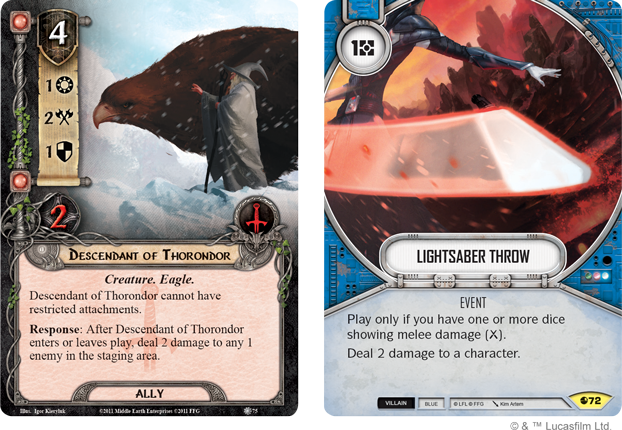 If we take Descendant of Thorondor (Shadows of Mirkwood, 75), a damage dealing card from The Lord of the Rings: The Card Game, and Lightsaber Throw (Spirit of Rebellion, 72), a damage dealing card from Star Wars™: Destiny, and compare them, we can tell a great deal about the settings of the games they come from. 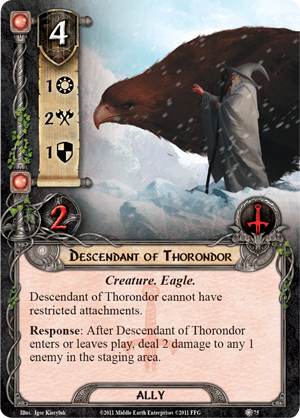 Descendant of Thorondor tells us something about The Lord of the Rings setting, as well as the general scale and feel of the game, one in which a giant eagle dropping from the sky to rain terror on your foes is appropriate. 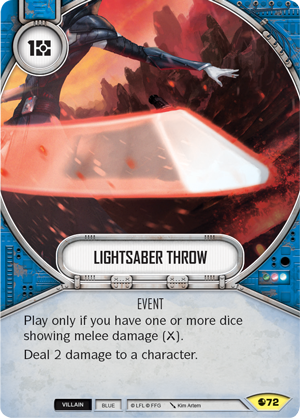 Lightsaber Throw paints us a different picture of a damage dealing effect, reflecting the high tech level of the Star Wars galaxy, as well as showing the more small-scale conflict present in Star Wars: Destiny. Both of these effects also provide a sense of how destructive these concepts are within the game world, grounding our perception and giving us a relative scale of expectations to work from in the future. A card’s title is, in a way, a snapshot of everything about that card, and as such needs to evoke a great deal of information with very few words. The other kicker is that those words not only need to convey that information, but they also need to sound good together! Words are powerful tools, that can be combined to evoke a sense of completeness or togetherness, but when combined incorrectly, they are discordant and actively fight against one another. If I were to name a card Scary Person, it certainly evokes some of the information that needs to be conveyed, but it’s awkward to say, and comes off as boring and bland. 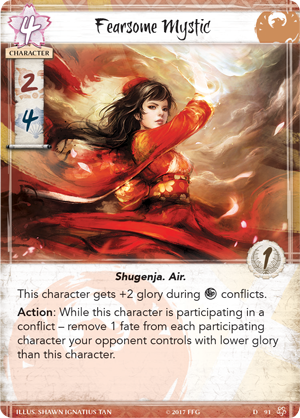 However when we shift that card title to Fearsome Mystic (Core Set, 91) it feels good to say, and provides a deeper view of both the game’s setting and the mechanics of the card. Going more in depth, a card’s title can help bind together the elements of a card, tying them into a tight package that feels like a complete and aesthetically pleasing idea. 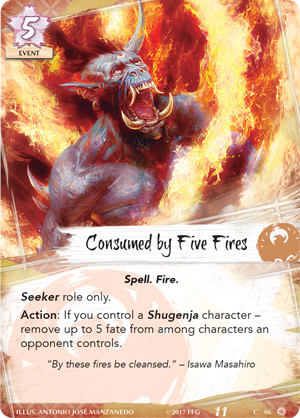 Consumed by Five Fires (Fate Has No Secrets, 96) is a great example of a card that achieves this. 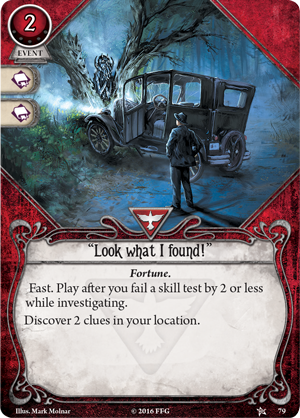 All of the parts of this card resonate to play off the idea of the number five. 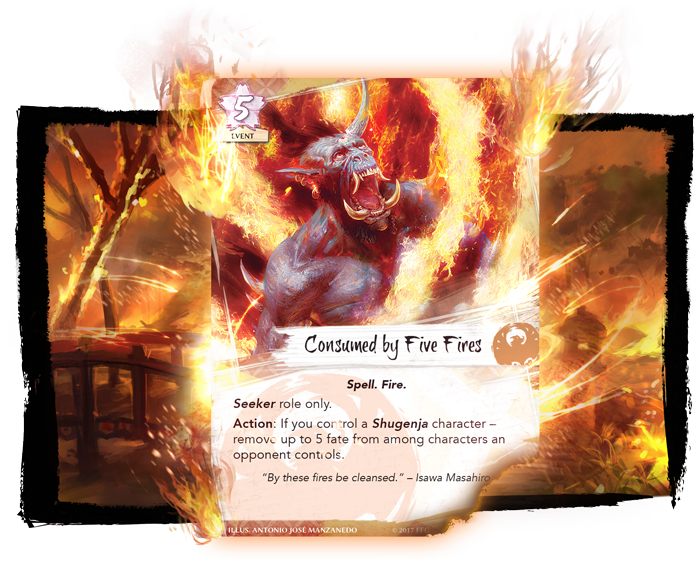 The card’s cost, its effect, and even the flavor text are linked to a title that rolls off the tongue and provides a sense of completeness. The final aspect is the functional impact of a card’s name, and this is one that players are likely most familiar with. Functionality is concerned with how a card’s name is used not just inside the game, but outside of it as well. We aim to ensure that cards have memorable names, especially for cards that are going to be played most frequently, in order to make it easier for players to talk about the game and discuss theory and strategy. A perfect example of this is the card Nightmares (Calm Over Westeros, 99) from A Game of Thrones: The Card Game. The card’s title is simple but resonates well with the card’s effect, making it quite memorable. 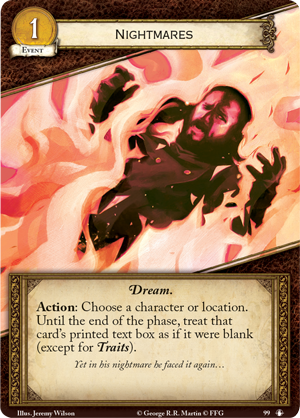 The card’s effect is also so simple and the name iconic enough that players could even refer to other cards that blank textboxes as “Nightmare” effects. This provides a shortcut that players can use to talk about the game. Another functional shortcut that names can provide is for use in a cycle of cards. In this sense, a cycle is a group of cards with similar effects, typically with one designed for each faction in the game. By keeping a similar naming scheme for each of the cards in a cycle, players can effectively shortcut discussions about the cards or their effects. Thanks for taking this stroll through the strange garden of card titles with me. Creating names is an aspect of design that can turn even the simplest cards into truly memorable experiences. Hopefully you now have a bit more insight into all the considerations we take when naming cards. But it does seem like the name is up, so I’ll catch you around next time! Tune in every Friday for a look at what designers at Fantasy Flight Games are thinking about with Designer Journals!